It's Facebook Fridays! for December 21, 2018, and this is your chance to experience the wonders of divination using bones, shells, and other small objects! Bone reading is an ancient mantic method practiced throughout human history, in various forms, by diverse world cultures. "Bones, Shells, and Curios: A Contemporary Method of Casting the Bones" by Michele Jackson describes a method of bone reading that is intuitive, personal, and accessible to all! The Lucky Mojo Curio Company is holding a random drawing to give away 4 insightful Bone Divination spiritual supply prizes. 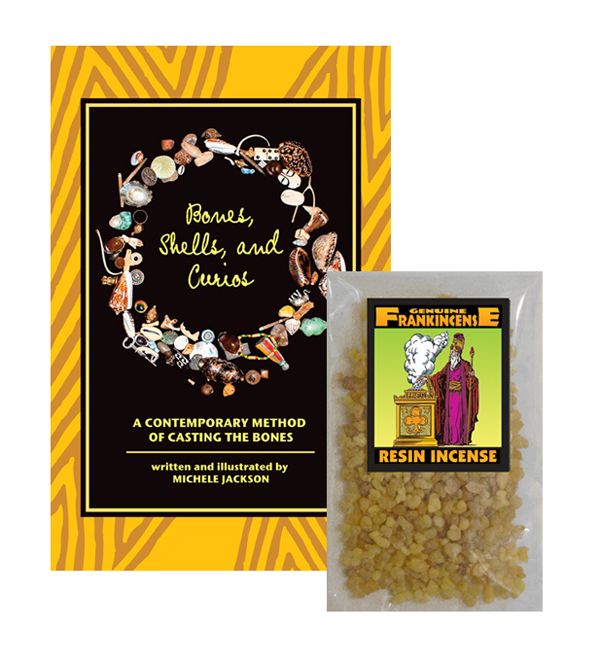 This week each lucky winner will receive a copy of Michele Jackson's "Bones, Shells, and Curios," along with a packet of Frankincense Incense Resin to cleanse and suffumigate your bones before casting, as described in the text. First thing tomorrow morning, we will select FOUR winners at random, announce their names here, and ask them to message this Facebook Page with their mailing addresses, so we can send them their FREE Bone Divination products. We have a winner! In fact, we have 4 lucky winners! Our Facebook Fridays! winners for December 21, 2018 are: Cheryl Precourt, Merlady Gibson, Jeri Wagner, and Bret Palmer.